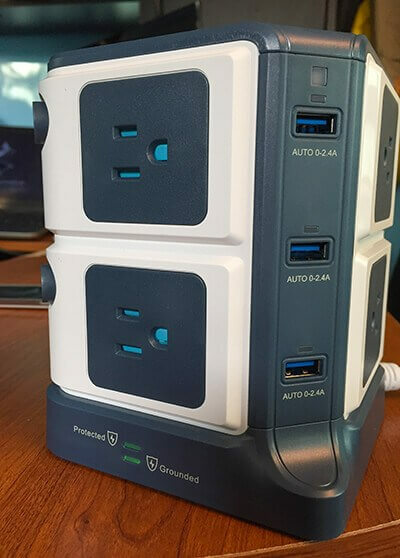 If you haven’t already done so, then I highly recommend reading our review for BESTEK’s other Tower Surge Protector because it’s a great device that has one of the best form factors for a power strip. Well, the great thing is that the form factor type of design is continued with yet another BESTEK product and this one is just as, or even more innovative than the previous power strip that we’ve reviewed. Overall, it’s going to come down to what you prefer, but either way, both of these power strips are basically perfect powering sources for your appliances and charging stations for your devices. Let’s see what the BESTEK PowerStrip with its 6 USB Ports has to offer. There are 8 AC Outlets in all with the power strip and the overall output in terms of Wattage is 1875W. It’s the same as most other Surge Protector out on the market so you won’t have any problems if you want to power your blender or fridge; basically, all appliances are welcome to be used with the power strip. The power output in other terms is 15A | 100 – 125V – 60Hz. There are 6 USB Ports on the power strip and each of them has a charging speed of 5V/2.4A and that’s really good. As most USB chargeable devices are going to be able to charge at their max speeds. However, none of the USB ports feature Quick Charge. That said, a 2.4A Output can charge tablets such as iPads at their max charging speeds. What’s even better when it comes to the USB port portion of the power strip is that the max output is 8A. 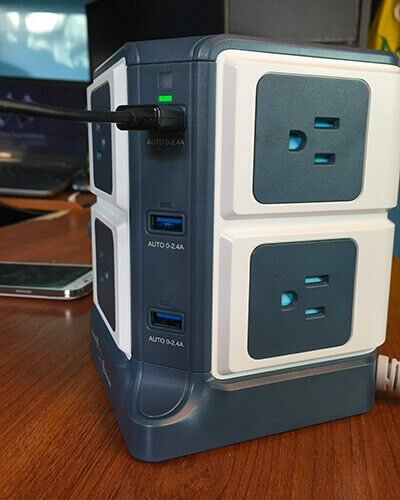 As a result of the Max Output being 8A, each of the 6 USB ports can output about 5V/1.2A charging speed when the max output is being reached. Overall, this power strip has a built-in 6-Port USB wall charger that allows you to charge 6 smartphones, or 6 tablets or a combination of the two devices. Convenience at its finest. The input requirements for this power strip is 100-125V which is basically the amount of power that any AC wall outlet should provide. The form factor of this BESTEK power strip is one of its best parts because of how easy it is to access all of its parts. It also looks really cool too, and with its tower-like form factor, the power strip can be placed on any surface for easier access. It has length and width of 4.8 inches because it’s basically a square. Then the height of the power strip is 5.7 inches, so it’s quite short and won’t be getting in the way at all. The weight of the power strip is 2.1 pounds. It’s lightweight and small enough so that if you really did want to travel with it, you can. There are quite a lot of functional parts on this power strip, so let’s go through them. There are two AC Outlets on each side, with one being on top and another being at the bottom. In order to actually use the AC Outlets, you have to use the power button that is on the corner of the power strip. Pressing the top power button activates the AC Outlets on the top side, and pressing the bottom button activates the bottom AC Outlets on the bottom side. Once you activate a portion of the AC Outlets there’s green LED light that turns on below the button. You can turn on both portions of the AC Outlets, so don’t worry about being limited. Also, the use of this button basically erases the need to unplug the power strip. There are 3 USB ports on opposite corners of the Power Strip and when you connect a device to a USB port its green activation light turns on at the top. There is no power button for the USB ports. Above both columns of the USB ports, there’s a Photosensitive Sensor and that’s able to control the USB light brightness for each of the ports, which means that if you’re in a well-lit room then the USB lights for each port will be brighter. Then if you have device charging with the USB ports in a dark room, each of the lights will be dim so you’re not disturbed while you’re sleeping and charging your devices. 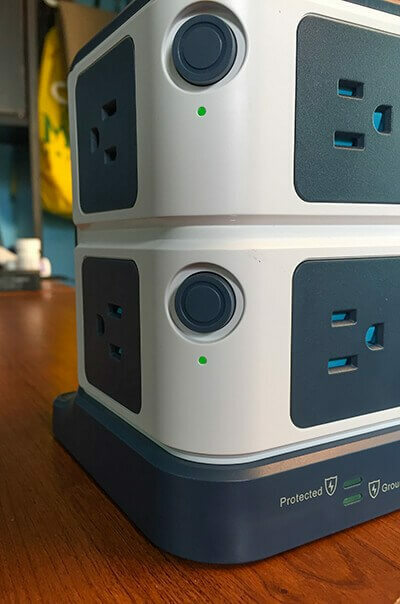 At the bottom of the Surge Protector is where you’re able to find the Reset button and also lights for indicating that the power strip is Protected and Grounded to ensure that you know when you’re completely safe using it. The power cord that power strip uses is 6 feet long so it should be long enough to place on your desk. One of the best aspects of this power strip is that the AC Outlets are so far apart and it’s great because there’s really no chance that you’re going to cover up the AC outlet next to it. It’s quite a common problem that other power strips have with having other AC Outlets get covered when you plug some appliances in, but luckily, that’s not the case here. 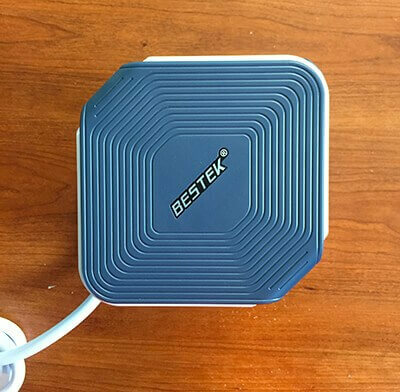 This BESTEK Surge Protector has a great build quality because it’s made of fireproof V0-grade PC and ABS material that makes everything completely solid. All of the components from its USB ports to its AC Outlets feel completely premium to use. One of its coolest parts is that it uses Safety Doors with its AC Outlets so it’s very safe to have around children and then when you add in the use of a power button for the AC Outlets, then this power strip is a very safe product. The tech for power strip is done very well because it makes use of a culmination of tech that is able to keep you and your devices safe. Reliability is the name of the game when it comes to this power strip because it has 8 AC Outlet with a very low chance of a surrounding AC Outlet getting covered. Then there are the USB ports that have very fast charging speeds and a high max Output to keep charging going. One of its best parts is the use of a power button for separate portions of the AC Outlet that basically erase the need unplug the power strip. There’s a lot of power to be used with this power strip when it comes to the AC Outlets and its use of the USB ports that each have a charging speed of 5V/2.4A and the max output of 8A. The design of the power strip is great with all of its parts on different sides and the use of a power button to activate and deactivate certain AC Outlets is simply ingenious. It has a great build quality that is able to be fireproof and also it’s able to deactivate itself if it goes over its powering capabilities. There are no reliability problems with this BESTEK power strip as it had lots of AC Outlets and 6 USB ports to keep your appliances powered and devices charged up. Power strips aren’t a new invention but the way that they’re innovated on can make them seem like a new product. This BESTEK power strip is an example of that type of innovation. One that provides quality and power.